Hello Monday. Well guess what? I’m a Mrs! The entire wedding weekend was heaven. From the bridesmaid luncheon to the rehearsal dinner, to the emotional ceremony to the lively reception…I wouldn’t have changed a THING! I am back in Cali and making plans for our two week honeymoon to Europe later in June. Before I left for Georgia, I had the pleasure of chatting with Amna from Examiner.com to discuss all things bridal beauty. It was thrilling discussing thoughts on what brides should think about on their big day plus tips and trends to try or miss. Known for her megawatt smile, infectious personality and major beauty and style tips, Emily Loftiss is the ultimate media maven. While you may have seen her dishing out trend tips or sharing her professional secrets on red carpet beauty on your favorite TV programs (Insider, CBS Morning Show, MTV’s MADE, and more), Emily’s extensive talents do not stop here. A former Radio City Rockette and Broadway darling, Emily’s resume is both impressive and ever growing. She’s successfully encapsulated all of her best kept secrets, tips and recommendations across the fashion and beauty worlds in one brilliant blog, Loftisssays.com. The website has quickly become an ultimate digital destination for all who desire a little peek behind the glamorous curtain of beauty. A major advocate of authenticity, Emily has not only made her unique mark in this competitive industry but has done so in fashion that inspires and connects. In addition to her professional success, Emily has equally found happiness in her personal life. The blonde beauty and her fiancé, Jay Carlington, tied the knot on Saturday, April 12, 2014 at a quaint plantation in Thomasville, Georgia. The Georgia native met her sweetheart in New York City and decided to take their her love west to California in 2013. I caught up with the beauteous bride to get the scoop on her best bridal beauty tips and trends and how brides-to-be can look their best on their big days. Amna Anwar: What does Bridal beauty mean to you? Emily Loftiss: Bridal beauty should be the best version of one’s self. I hate seeing a tomboy all done up and looking nothing like herself. Be true to yourself. You want to prepare for the big day like you are going to a lovely black tie dinner-beautiful dewy skin and effortless hair. 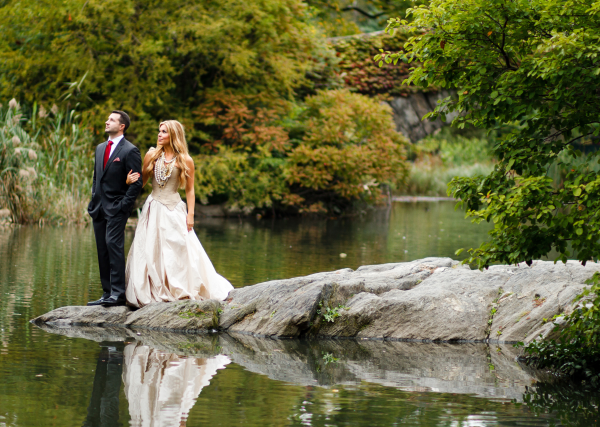 Your wedding day does not mean a celebrity transformation – get that notion out of your mind. AA: What are your favorite wedding/bridal beauty trends? Which are some to avoid? EL: I love a smoky eye! Smoky doesn’t always mean black – it could be created of browns and gold tones. Make sure you don’t forget about the lashes as this event is all about your eyes and the emotion behind it. Also, I love some nail art but on your big day but I’d suggest skipping the craziness and go for pretty. You can even do some glitter, just keep in mind that you want people to look at the whole package not some initial on a statement nail. READ THE REST OF THE INTERVIEW AND SEE ENGAGEMENT PICTURES HERE. Tags: beauty blogger, Beauty expert, beauty tips, beauty trends, bridal, bridal makeup, brides, brides. southern bride, Examiner, examiner.com, wedding makeup, weddings. Bookmark the permalink.